During San Diego Comic-Con last week, Entertainment Weekly sat down with Avengers: Age of Ultron stars Robert Downey Jr. and Mark Ruffalo, where they offered new details regarding this highly-anticipated sequel. However, before we get to their interview, Marvel has unveiled yet another official prop from Avengers: Age of Ultron, the fist from Tony Stark's Hulkbuster suit. Take a look at the image below, then read on for more details. Both Robert Downey Jr.'s Tony Stark and Mark Ruffalo's Bruce Banner have come to be known as The Science Bros in Avengers: Age of Ultron, and, as it turns out, they are also now roommates in New York. 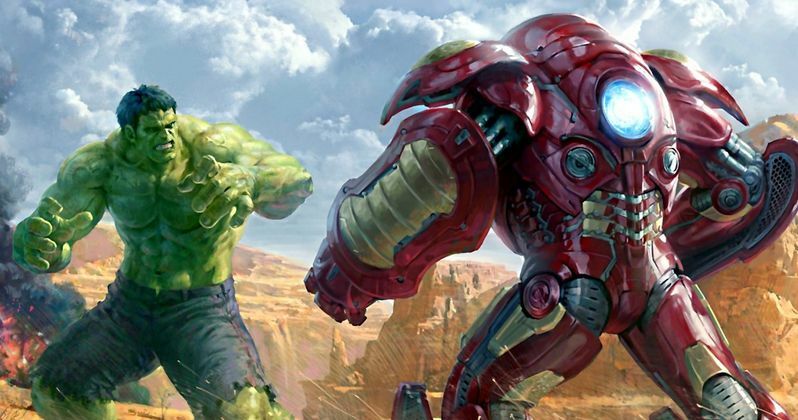 Here's what Robert Downey Jr. has to say, teasing how the Hulk and Hulkbuster confrontation begins. "Stark has set Banner up to be able to continue his good works in Stark Tower, and Tony has a project of his own. So, it's one of those things where it's like your second development team 'Hey, how is it going over there, that looks really nice and green; can I talk to you about this other idea I have' and it winds up being not such a good idea." Naturally, that "project" ends up being the creation of Ultron, and Robert Downey Jr. reveals that Bruce is morally opposed to the project. "Bruce is dubious as to the moral psychology of this project idea of Tony's. And It's nice because it sets up a little bit of tension between us." While Mark Ruffalo wouldn't share any specific details, he teased that the conflict does get explosive. "It sort of blows up." Mark Ruffalo also discussed Bruce Banner's mindset going into the follow-up, where he feels like he's a part of the team now. "I think he feels like he's a part of a family now. I think that Tony has made it really comfortable for him. We're flatmates now. He feels like he's part of the team for the first time. It doesn't always go the way he plans though." Robert Downey Jr. also praised writer-director Joss Whedon for the direction he's taking the story in. "If you remember, the whole point of the first Avengers was, 'Can these folks work together and do something very difficult and very important?' This time, we're sort of assuming that they can, and how do you further complicate it? I think that's what Joss (Whedon) has done a great job with. I really think it's going to be a great follow-up." He also discussed how Tony doesn't want the world to depend on the Avengers, going into Avengers: Age of Ultron. "He's just trying to make it so the world doesn't have to count on these flawed people. He ends up having a really good idea, it just becomes corrupted." "Joss said the only way to top shawarma is to do nothing... but there will be something."